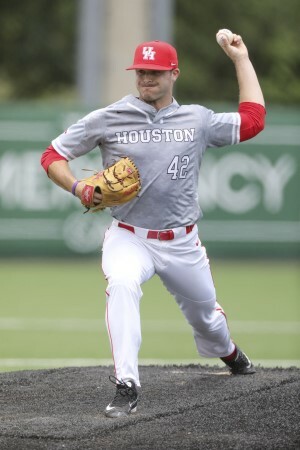 The 2017 baseball season was a rollercoaster for the Houston Cougars. Ups, downs, a starting pitcher dismissed, a new player arriving after the semester ended, and a late rally to win a share of the regular season and the outright tournament championship. The Coogs started with two wins on opening weekend over Wake Forest, who finished 10th in the RPI (which would be huge by the end of the season). A few weeks later, UH got a two-game split with eventual CWS team Cal State-Fullerton. The team then traveled to Waco where Baylor held us to just 3 runs in 3 games. 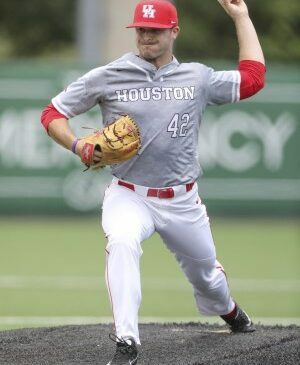 But in the finale, senior John King threw a complete-game shutout to give UH much-needed momentum. That momentum was the start of an 11-game winning streak as the Cougars began to play some pretty good ball. Sitting at 19-6 heading to April, the program seemed to be in great shape. But trouble was already brewing. Starting LHP Seth Romero, considered one of the top 10 picks in the upcoming draft, failed a team-mandated drug test, earning an indefinite suspension. The test came after he was caught posing for a photo with a bong while in uniform before a game at UC-Irvine. The next weekend, presumably after his Friday night start, Romero missed curfew in Orlando. The team had really started playing well but Seth Romero put his needs first, once again showing poor leadership and decision-making skills. Coach Whitting announced the suspension just before the ECU series began – the Cougars then erupted for 17 runs that night. Coincidence? Despite a sweep of ECU and a 4-2 start to the month, the season began to drift – UH ended April with just a 9-9 record. The biggest issue was a lack of pitching depth caused by a few nagging injuries and Romero’s suspension. 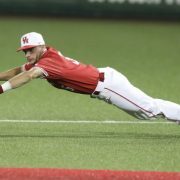 In the 63-game season stretching from mid-February until June 5th, 40% of the runs scored against the Coogs came in April’s 18 games. Seth Romero put his needs first, once again showing poor leadership and decision-making skills. On Monday, May 1, Whitting reinstated Romero following a month-long suspension. Tuesday, Joseph Duarte published an exposé on the suspension and Romero’s falling draft stock. Romero entered a game at SHSU that night in relief and gave up the lead and took the loss. He then gave up 2 more leads that weekend vs UConn including another loss on Sunday. Following the series final, Whitting began a feud with the beat writer Duarte, presumably protecting his rattled pitcher. With the team coming apart, freshman backup catcher Nick Slaughter and Romero got into a fight just before the team bused to Sugar Land for a neutral site game vs Rice. That was the last straw for the left-handed pitcher. Romero was dismissed from the team before the game. For his part, Slaughter got the start in right field that night and went 2/4 with 3 RBI in his ‘hello world’ moment. Down 5-0 after a half inning, UH beat Rice 6-5 due in large part to Slaughter. an otherwise ho-hum 3-2 record with the Coogs in 3rd place in the conference. But somehow, out of all of this drama, something clicked. The turnaround the Cougars needed materialized and they finally came together and started to produce. 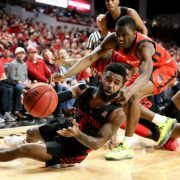 Following the Rice game, UH was 31-17 and looking at a possible 2- or 3-seed in the NCAA Tournament. Cooper Coldiron, a JUCO player that first became eligible the day after Romero’s dismissal, immediately provided steadying leadership and a boost at shortstop. 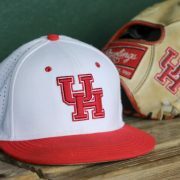 Over the next 19 days, the Coogs went 10-2 including 5 one-run wins – moving the team to the top of the AAC standings. 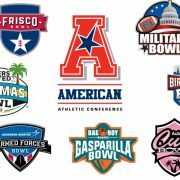 Houston won the final two games of the season to claim a share of the AAC title. UH then sprinted through the field at the AAC Tournament in Clearwater, Florida, to win their second conference championship in a week. At that point, the Coogs were one of the hottest teams in the country. While flying back from Florida late in the day, the team learned they would be hosting a regional for the 2nd time in 3 years. Unfortunately, that Sunday was pretty much the high point of the season. 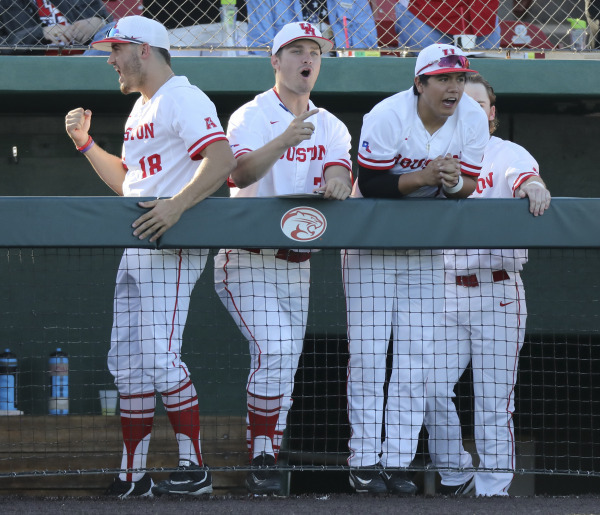 In front of a crowd of over 3400, the Coogs lost the regional opener to Iowa before beating Baylor in game 2. Houston eliminated Iowa on Sunday putting UH in the final, needing two wins over A&M for the regional title. Down 4-0 in the bottom of the 9th, the Cougars rallied for 3 runs before a two-out strikeout ended the season. The disappointing finish to the 2017 baseball season can’t overshadow the standout individual performances. 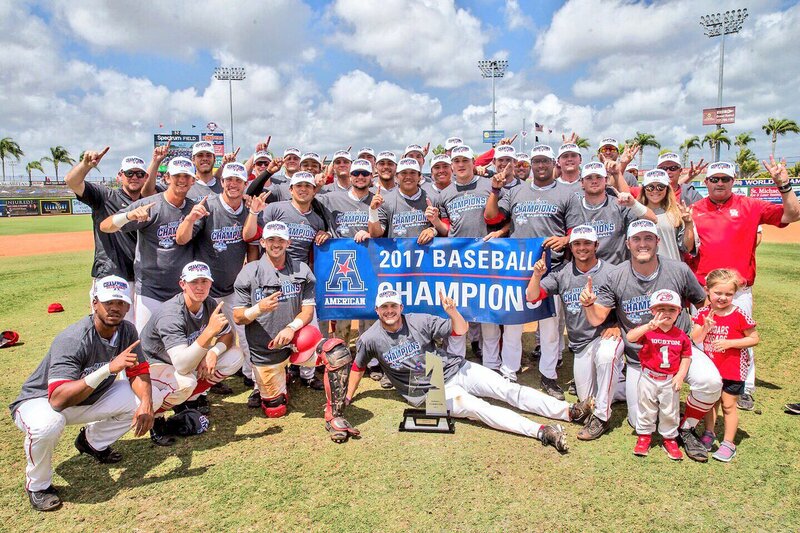 2017 was the first time in school history that UH players won both the Player and Pitcher of the Year in the same season. Jake Scheiner was the American Athletic Conference Player of the Year. He won the triple crown in the AAC as well (.346 avg., 64 RBI, 18 HR) in his only season on Cullen. LHP Trey Cumbie won The American Pitcher of the Year and won 10 games. He finished with a league-best 2.04 ERA. Both Scheiner and Cumbie were named All-Conference First Team. Corey Julks (.335 BA), Connor Wong (12 homers), Mitch Ullom (6-3 record), and Joe Davis (73 hits) were named to the All-Conference Second Team. The 2017 team will be remembered as one of the best in Cougar baseball’s golden era. A 42-win season, two conference titles, and hosting a regional are all major accomplishments. But expectations have grown perhaps faster than the program’s accomplishments dictate. Conference titles are celebrated but now regional titles are somewhat expected. For many, there is a sense of disappointment in finishing another season just short of Omaha. In the last dozen years, all of Rice, Texas, Texas A&M, Baylor, Texas Tech, and TCU have been to the CWS. It’s time to add the University of Houston to that list.